The Australian Cattle Dog was bred in the 19th century by Australian cattlemen who sought a dog who could handle the harsh climate and working conditions of Australia. They crossed the native Dingo with various herding dogs to produce this hardy, strong canine that could control and herd the almost wild cattle across vast distances under harsh conditions, thus making the Australian Cattle Dog instrumental in helping expand the Australian beef industry. In 1893, a gentleman by the name of Robert Kaleski started breeding and showing Blue Heelers and drew up a standard for the breed which was later approved in Australia by The Kennel Club of New South Wales. 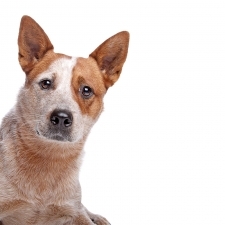 The Australian Cattle Dog is such a high-energy dog that it needs constant mental and physical activity. They are very strong, loyal, and intelligent, capable of learning complex tasks after only a few repetitions. These dogs are very devoted to their owner and family, and like many herders, will be a one-person dog. Once they bond, they like to go wherever their owner goes. They have a strong personality and will need an owner who is just as strong and stubborn as they are. These dogs do best in working environments such as a farm, and if they don’t live on one, they will need something else to do or else they can become very destructive. Australian Cattle Dogs love children, but there is a caveat: Some will nip at the heels of children in order to herd them. A “nip” from this dog will not be serious, but it does cause pain to the child, so early training is a necessity whenever this dog and children reside in the same house. On the other hand, they are excellent guard dogs and will protect the family, as they are absolutely loyal and obedient to their masters. The Australian Cattle Dog usually weighs between 30 to 35 pounds and stands approximately 17 to 20 inches tall. Their build is stocky and sturdy. Their hair is coarse and comes in blue or red with markings of various colors. Other names that the Australian Cattle Dog go by are Blue Heeler, Red Heeler, Australian Heeler, Hall’s Heeler, Queensland Heeler or Queensland Blue Heeler. In other words, these dogs are heelers!